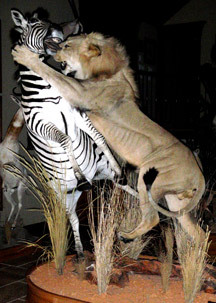 The highest quality taxidermy can deteriorate and become worn and dull looking when not cared for properly. LOCATION: Keep your mounts away from direct sunlight, which can cause fading. Avoid sources of heat such as furnace vents, fireplaces, or woodstoves. Heat sources can prematurely dry a mount and cause cracking in skin and hair and fur to become brittle. MAMMAL CARE: Dust and grease can build on mammal mounts causing damage. Lightly use an upholstery attachment on a vacuum and gently work it in the direction of the hair. Then, using a damp cloth or dry pantyhose gently wipe the mount in the direction of the hair to remove remaining dust. For grease or other residue, use a small amount of liquid dish soap on a lightly dampened cloth. Lightly brush the mount with a soft-bristled brush. ANTLER & HOOF CARE: Use a damp cloth to take care of most of the dust. It may be necessary to use a small amount of liquid dish soap to take care of any remaining stubborn dust or grease. EYE CARE: Use a cotton swab with a small amount of glass cleaner to bring back that life-like luster to the eyes of all your mounts. INSECT INFESTATION:Dust mount lightly with Borax and leave overnight. Then vacuum the mount lightly with an upholstery attachment. It is recommended to clean and take care of your mounts on a regular basis. This will help keep your trophies looking their best and lasting a lifetime. Contact us if you have any damaged mounts that need repair or require a professional cleaning.